Small enough to carry with you wherever you go, a compact digital camera is ideal for day trips and holidays to provide you with images of those special memories. Choose from a wide range of compact cameras from leading brands such as Canon, Fujifilm, Sony, Panasonic, Ricoh and more. Where do I use my wex photographic voucher code? 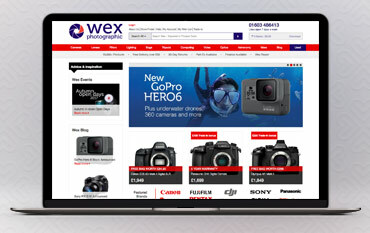 Wex Photographic is a dedicated online retailer with top brands in digital cameras, digital SLR cameras, lenses, attachments, filters, bags and tripods, as well as additional techy toys like computing tablets, astronomy gear, optics and plenty else besides. Use a Wex Photo & Video voucher code to save money on your online shop at the store. At Wex Photographic you will find all you need for Photography at any level. Established in 1997, it offers an array of Cameras, Lenses, Filters, Tripods and much more, all at extremely competitive prices and with free delivery on orders over £50 and outstanding customer service, Wex Photographic is the perfect place for all your camera needs. The Wex photographic trade in lets you part exchange your existing camera and receive a credit note so you can buy your new, upgraded camera for less! It is really easy to do, in just 3 simple steps - get a quote online at Wex Photographic, they collect your old camera from a selected pick-up point and then you get a credit note - easy! Wex Photographic have in stock a wide selection of branded Cameras including Canon, Nikon, Sony and Pentax, Fuji and much more. At Wex Photographic you can buy a Canon Camera for as little as £99 and there are cashback options available too on all the different brands of cameras. So if you are looking to take some snaps at a reasonable cost, then be sure to check out the UK's biggest online specialist retailer in photography. How can I contact Wex Photographic? Please call 01603 486413 or email here. You can use the store finder to find your nearest store. Wex Photographic allows you 30 days to return your order. A talented photographer can only maximize the capacity of his camera. Do not let your talent go to waste with subpar equipment. Wex Photographic Warehouse Express is the perfect buddy for every photographer as it provides all the necessary equipment and supplies necessary for their art. Add a Wex discount code and get your camera equipment for less.